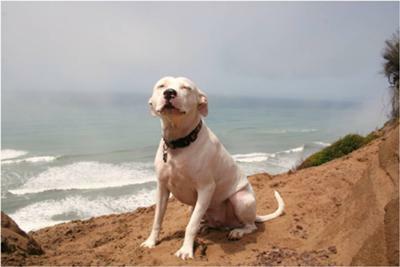 On my way home from work one evening four years ago, I passed by a guy panhandling as his pit bull shivered in the misting fog that routinely envelops San Francisco. Instead of tossing some coins I asked the homeless duo to follow me to PetCo, where I purchased the dog a sweater, rain jacket and leash. Sure enough the guy remembered me real well on subsequent commutes home -- they conveniently camped out at the point where I had to transfer from underground to the bus. Several weeks later I watched his dog for the weekend. Several months later, the guy called me to say the dog had been hit by a car and split somewhere near Golder Gate Park. After spending a day putting up flyers, I got two calls from people who had spotted the dog. Unbelievably, I found the dog not far from where the callers had spotted him. After a $200 vet bill, the dog retreated to my couch where he would rehabilitate for the two-week course of antibiotics. We had agreed to meet at a park after the dog had made a near perfect recovery in the two week time frame. The guy did not show. Peck and I just celebrated four years together. He is the sweetest and most mellow dog I have ever encountered. He loves the beach, turkey treats and being by my side. We are inseparable. My family, friends and neighbors adore Peck. He gives pit bulls a good rap!